Another week - another HSMAdvisor update! Yesterday i uploaded a newer version. You can download it already. 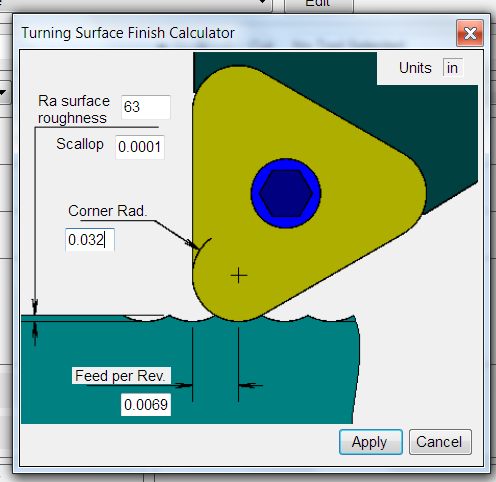 Major change is only one: I have finally come around to implementing a Turning surface finish calculator. After selecting any Turning Tool type, a "Scallop" button on Comp. panel will open a separate Turning Surface Finish dialog. As usual you can change the units of measure by clicking "Units in/mm" label in top right corner. Default units will be the units of chipload. Also a corner radius is needed for calculator to work. After you click "Apply", proper feed override is applied to the final result to get the surface finish you desire. Scaling issues under DPI greater than 96 were addressed and i think from this point on i should get much fewer reports about things being cropped off in wrong places. Still, if something looks odd on your system, please let me know! Turning Cuts with mixed in/mm data saved in them used to have conversion issue. It has been fixed in this update. Also collapsing panels that used to close when another panel is being opened now operate independently. Many people as it turns out like ot have ALL of the panels expanded at the same time.